Over the years I have been a panelist in many of the interviews for Java Developers. I have previously written a post titled Top 7 tips for succeeding in a technical interview for software engineers which covers few of the general guidelines. 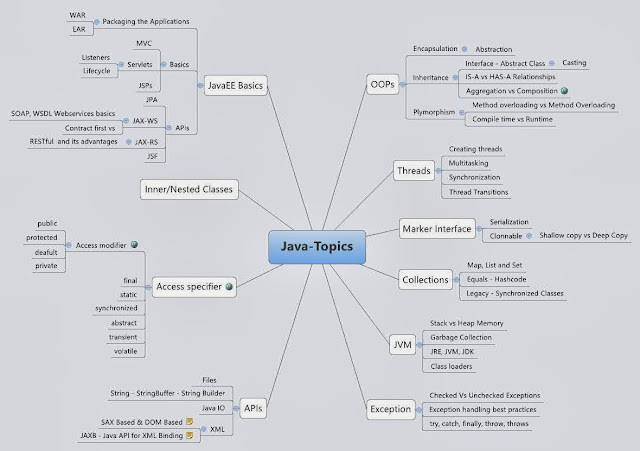 In this post I will share a mind map containing general topics covered in a Java developer interview. I have prepared this as a general reference for myself to remember the pointers and to keep a common standard across the multiple interviews. XMind gives a nice listing of the map. You can find the map here. Here is Image which you can download and use. Finally here is a old fashioned tabbed content list which is easier to copy paste. This is a work in progress and I hope to refine it further. Let me know if you have any comments.